Pressure washers are an extremely effective means of cleaning surfaces around the home, or for commercial business processes. No more scrubbing surfaces by hand; these machines not only shave off valuable cleaning time, but also help to remove tougher stains that don’t always come off easily. You can pick up washers in a range of shapes and sizes, from budget, entry-level washers, up to more powerful and durable heavy-duty units. Below, we’ve put together a list of the top heavy-duty pressure washers on the market. For commercial purposes or constant, heavy use in the home, the Shark SGP-353037 Pressure Washer is perfect. This keeps the internal components well-protected. Thanks to a built-in heater, this washer can support the use of cold or hot water. To offset the increased safety risk of hot water use, the unit also features a control switch that automatically shuts the heater off when it exceeds a set limit, something that was likely instrumental in giving this machine a safety-approved ETL certification. Design-wise, the Shark SGP-353037 carries an 11-Horsepower engine that produces a steady output of water that can be used cold or heated, for additional cleaning power. We also like the steel frame, which provides a great deal of durability, absorbing any knocks or scrapes. In terms of long-term durability, the warranty is also reasonable, with anywhere between 1 and 7 years on all parts. This machine is less suited to use around the home, given that it is so heavy and has large dimensions, making it difficult to lug around. This cumbersome nature of the product also means that it takes up a great deal of storage space. This Easy-Kleen Pressure Washer from the premium range of washers makes our list, not only for being a powerful cleaning unit, at 14,000 CU, but also due to its durable design and range of unique functionality. This washer comes with an all-encompassing frame that fully protects the hot water tank and engine. An easy-access control panel allows full user control over the various functions, such as adjustable pressures and adjustable temperature. As one of the only hot water-only models on our list, this is a unique pressure washer. Hot water helps to enhance the cleaning process when you’re struggling with tough stains. There’s also an adjustable thermostat that allows you to specify the temperature you’d like. There isn’t much negative to say about this pressure washer, aside from the fact that it doesn’t come cheap, as the second most expensive model on our list. It also weighs in at 400 pounds. The wheels help to offset the carrying weight, but it’s still tough to move around. Though hard to pronounce, this model makes our list owing to its small but powerful motor, which explains how it got the name ‘Mi-T’. It’s roughly half the price of some of the more powerful engines around and takes up half the footprint, too. Though this pressure washer has a smaller footprint than some other models from the same category, it has a powerful CU rating behind it, meaning it offers an efficient clean. This is made simpler by the 50 feet of strong hosing that helps reach around the car or reach higher walls outside the home. ​​Powder-coated steel housing protects the engine’s inner workings. For a model with a relatively high price tag, the design doesn’t quite equal similarly priced gasoline models. Despite the powder-coated steel offering some scratch resistance, the overall design in terms of engine and components feels more exposed to damage, given that the frame is far smaller and almost entirely consumed by the large engine. Also, you’ll have to fork out for regular gasoline refills. At 4,000 PSI and 4.0 Gallons Per Minute, the Pressure Pro E4040HC Pressure Washer beats many of the models we’ve looked at in sheer cleaning efficiency. We’ve chosen it for being lightweight and easy to use, as well as having a relatively small price tag. 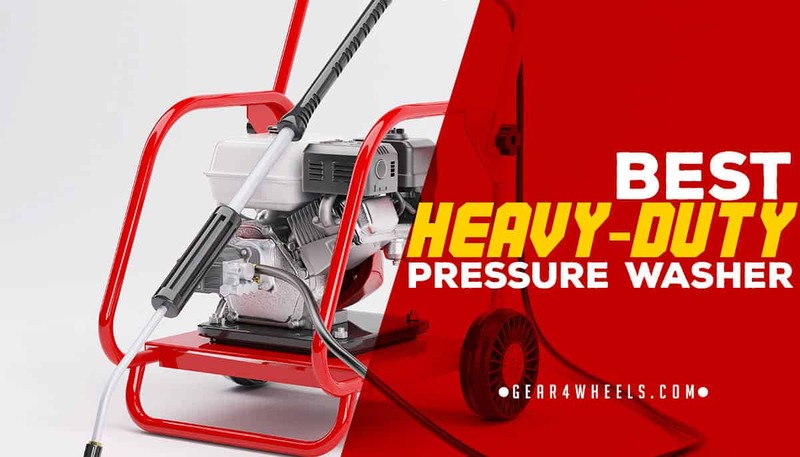 The power for the Pressure Pro is provided by a high-quality Honda engine putting out 13-Horsepower, which contributes towards an impressive CU rating, one of the best of those washers we’ve looked at. Other features include a generous length of hosing reinforced with steel, and numerous quick-connect nozzles. A thermo-sensor also helps to prevent the machine from overheating. The built-in Honda engine is super-efficient and near-silent, whilst putting out an impressive level of cleaning efficiency that is higher than many competitors. We also like the generous length of hosing that comes with this machine; whereas many non-commercial units have around 20-25 feet, this washer has a 50-foot hose, which is perfect for bigger cleans. It’s also reinforced with steel for long-lasting durability. Despite being quite a lightweight machine for a washer that is commercial-ready, this unit has just 2 wheels as opposed to 4. This makes it more difficult to maneuver, as it requires more strength to lift at the unsupported end. Additionally, the frame that surrounds the engine and other components is reasonably small and doesn’t fully protect the internal parts from damage. We’ve chosen the NorthStar 3,000 PSI Pressure Washer for this list as it’s a much more affordable machine than the Shark washer for example, but doesn’t sacrifice on the solid, durable design seen in heavy-duty machines. Though advertised at 3,000 PSI, this model has an adjustable pressure feature for customizing the machine for the job at hand. This is generated by a cheaper electric motor, which is less commonly seen on such heavy-duty models. What’s more, a Start/Stop feature helps to prevent damaging pressure build-up. One of the things we like about this model is that it is so much more affordable than many other heavy-duty pressure washers that rely on a gasoline-powered engine. The saving is considerably large. This makes it an ideal choice for new business owners with less money to invest. What’s more, the manufacturer foregoes aluminum for a tougher forged brass chassis, with greater durability. Though made from durable materials, there is a drawback to the frame. Forged brass is heavier than aluminum, making it more difficult to push about for extended periods. The cheaper electric motor also has less power than a gasoline alternative, and requires a special plug that you may not already possess in your home; this plug can be expensive. In our opinion, the best pick of these top 5 heavy-duty pressure washers is the Shark SGP-353037. Unlike some similar models, the chassis affords a good deal of protection to the already-durable internal components, while it’s also backed up by an impressive warranty. Though the frame and components create a cumbersome, heavy product that is to be considered, this pressure washer has four wheels to make it easier to lug around.